I’ve been involved in our company’s Human Resources Department and I know how hard it is to choose among competitive applicants for the vacant positions. You’ll have to compare qualified applicants according to their education, experience, intelligence and salary level. In my own capacity I do some tests to gauge their abilities, skills and state of mind. I do some IQ tests on a time-pressure level and subject them to a simple psychology written exam to test their mind levels and some characteristics. After all those tests and examinations on all qualified applicants we do series of interviews and sometimes all these tasks that I do seems to tire me especially if we’re hiring the higher ranks of employees. Sometimes I wish I would just look for a good Executive Recruitment Firm Directory to help me choose the best applicants for the vacant positions in our company. Finding the best employees for your organization is no joke. This is where Dennis Carey, the leading executive recruiter comes in to help you in your predicament. More information can be found in Dennis Carey's profile. I know they have the ability to look for the best candidates that would fit it in all the high standard requirements of the company. It’s good to hire them because you can be assured that you’ll get the best individuals and manpower for your corporation. It looks like hopiang baboy on a first glance but they're actually chicken empanadas, not the usual commercial type empanadas to explain the hopia-like. When I first picked it I was expecting a somewhat sweet taste of hopia but when I tasted it I discovered that it’s my favorite empanada. 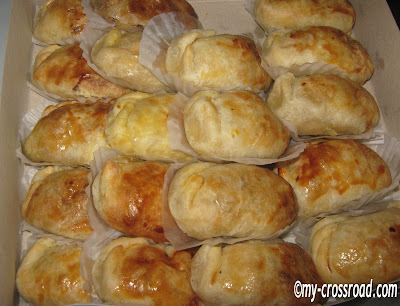 My boss' daughter brought these yummy chicken empanadas on one occasion here in our office. I just ate one because it's so heavy on the stomach and I also had liempo and cakes then lol! Happy Food Friday and enjoy your weekend! It’s always nice to see cool advertising strategy especially those with captivating videos that will catch your attention. It helps to promote the products because no matter how good and economical your products are it will not hit sales if you don’t think of a good marketing promotion. I was browsing online for some air conditioning providers when I found and easily liked how they present their products. I’m referring to the advertising done in television by All Year Cooling and Heating which I find very tempting indeed! They have discount presentation and boast of quality and product guarantee. I bet you will really look for their best deal products which offer very low prices. In these days of economic crisis people tend to look and buy products with sale items and competitive prices without sacrificing quality. Those products with quality and best discounted prices usually get more sales. Quality and economy are the two well-matched team which are hard to beat. 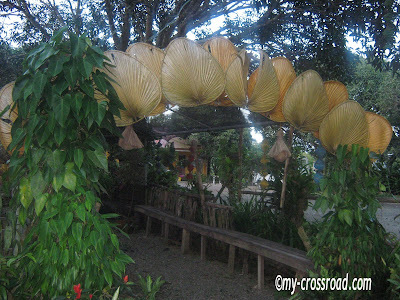 These are the native fans which will welcome any visitor wanting to take a dip at Villa Dominga’s Resort. Just can’t control myself taking a shot on this as I find it cute to place all those fans at the top of the entrance. I just noticed that some are not perfectly maintained just like the whole place. The owner told us they’re just beginning to bring back the old beauty of their resort. Due to some circumstances few years ago the resort wasn’t maintained properly but now they’re doing their best to restore its beauty. We can feel the heat now of the coming summer months ahead of us. As early as the third week of this month days are becoming hotter. Suddenly air conditioners became the focus of many people seeking refreshing coolness from them. 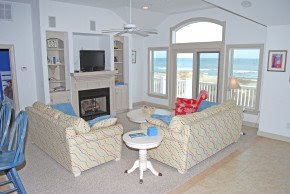 And because I thought of summer months I realized I should be planning now for some vacation where we can unwind stress and pressure from work. 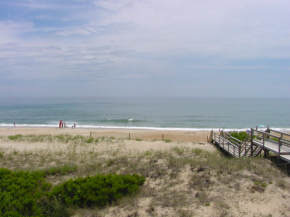 I saw my boss surfing and exploring on some Outer Banks vacation rentals, she can afford it anytime she want and it’s her hobby. She always visit beautiful places especially those with breathtaking views and beaches. 1.) I love the color red and pink. 2.) I'm a born-again Christian. 3.) I'm a very friendly person, all our clients in my work became my friends lol! 4.) I'm a daddy's girl. 5.) I love chocolates whatever it is, don't care much if it's expensive or cheap just as long as its choco! 6.) I love cooking, baking and everything about the kitchen. 8.) I love lettering and drafting. I have speedball book and speedball pen. 9.) I'm a graduate of Bachelor of Science in Computer Engineering but my present job in a telecoms company is that of an Accounting Officer and deals with billing, collection and international carrier settlements. I also do Human Resources and Admiistration works, very far from what I studied in college don't you think? 10.) We're three siblings in the family 2 girls and a boy, Now I also have three kids 2 girls and one boy, what a resemblance! 11.) I used to be boyish when I was a kid until I graduated and had my first job but when I met God in my life my college friends can't believe my looks now lol! 12.) My hubby is my bestfriend for two years before we realized both that we love each other, he's my first! 13.) My plans always materialize in time or a little bit overdue! I told myself to get married before 30 and I got married at 28, I wished that I'll deliver my last child before I reached 35 and I delivered Josh 3 months before I turned 35 and now I want to retire from office work at 40 and I got approved after 10 months of extending my stay but I turned 41 before my boss approved it, a little bit delayed lol! 14.) My hubby loves me so much that sometimes I got spoiled! 16.) I love action and adventure movies. 17.) I always carry my notepad, ballpen, digicam, handy phone and eyeglasses wherever I go. 18.) I don't wear jeans same as my fellow sisters in my church. 19.) My hair is always black, straight and long. 20.) I love flat shoes because I don't want to look taller than my hubby. He's taller than me but girls looks taller than they really are. 21.) I love veggies and tofu together and I know more than a dozen ways to cook it. 22.) I don't want to drive because I feel very relaxed riding a vehicle like a swing :-) and most of the times I feel very inspired to write while on travel. 24.) I can't breathe on confined areas, a mild claustrophobic person. This is rather long.... I'm tagging Liza, Cecile, Redge, JennyL, Lisa, Tita Beng, Lainy, Gem and everyone who feels like doing this tag.... just be patient! We reached our home yesterday night around 10pm because we picked up the plants that I bought from the garden neighbor of my office building. Coming from the church hubby and I parked at the front of my office and walked to the garden nearby. It took us a while but we’re finished just in time for the kids getting bored. I was feeling very tired when we reached our home and was wishing of a good night’s rest at the sleep number bed I saw online. I was getting used to online shopping these days. Anyway my new bed is just as good as it can also give me the kind of comfort I want, we bought it two months ago. My Top 3 Meme. Thanks Bes JennyL for this one! ~Three Gifts You Would Like to Receive: - HP Notebook, Free Baking Class Registration/Enrollment, Vacation Package for the Whole family, kinda grand lol! Feel free to grab this if you want! What a relaxing thought it was when my sister's office schedule now have Saturday day offs twice a month. It was actually a year ago when this schedule was proposed reducing Saturday office on their company but it’s only this year that the proposed schedule was approved and implemented. Of course Redge was so excited about these extra days because for years she didn’t have much time for her chores and other activities not to mention the rest that she will be doing on these days. My kids and I were equally happy because now we can shop together in supermarket and department stores. This day she copied some movies on my PC and relaxed herself into watching a movie on her own PC. I told her it would also be nice to watch on an LCD HDTV because it would be clearer and more defined. We don’t watch movie on the big screen so it would be nicer if we watch it on an LCD HDTV. Josh was so happy seeing his friends again, what I’m talking about were the 3 small girls his age that grew up in the same compound. 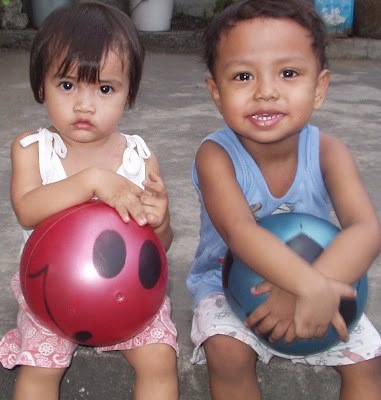 One of them is my goddaughter; they were the kids of Raymond and Mhel. They were so close to me and my Mom and it saddened us when they transferred to Tarlac because Raymond got a job as chef of princess in Middle East. Now they’re here to attend the wedding of Mhel’s brother Jeff who took over the renting of our apartment. 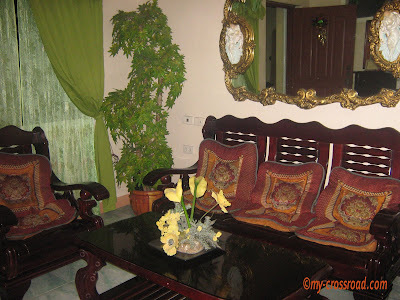 Our apartment was first rented by their eldest brother Arman then it was transferred to Mhel when she settled down with Raymond and now that Arman and Mhel both live in Tarlac Jeff took over. Our apartment is like a starting over nest of newly weds and we’re so happy that this family liked us so much that they passed it to their younger siblings to start a family. Here's an old picture of one of the kids - Hannah (my god daughter) with Josh who is 2 years and 7 months old then. Wow! This is truly a fully-loaded snack, it’s Jollibee’s Mr. Champ! Of course everybody knows this heavy-duty sandwich from the national burger of the Philippines lol! It’s loaded with 1/3 pound beef patty, with veggies, cheese and everything that spells delicious. But it also a threat to your diet as it’s full of calories too! 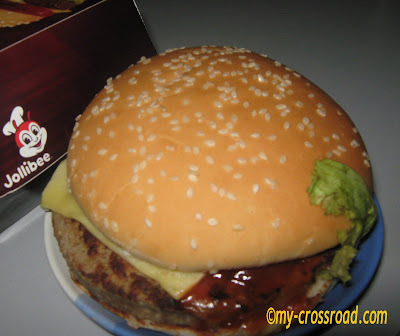 You have to watch your weight here or be ready to get the best weight loss pills after eating this yummy burger! Anyway it’s my snack today, care to eat with me! Happy Food Friday to everyone! Enjoy your weekend! I just love this shot that’s why I picked this one for this week. 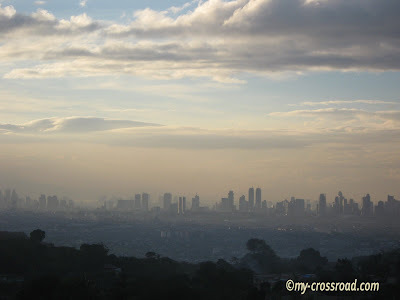 I’ve taken the shot from a wedding reception resort in Antipolo overlooking the towns nearby extending the view up to the business district of Ortigas Center. I have always liked to do the shot because it’s really breathtaking from where I stood. Anyway just had a limited time as I’m attending my niece’ wedding reception. Look what I’ve found - An article that guides us in saving our hard earned money and using it wisely on buying quality and economy. I’ve read the whole article and I’m really excited finding Zenni Optical in the New York Times?! They suggested some tips on vision care including buying Zenni Optical’s quality and stylish Prescription eyeglasses for only $8! This is great as I really believe that having nice eyeglasses doesn’t have to be so expensive. You can look forward to Seeing Straight Without Breaking Bank as you don’t have to waste your money just to have stylish glasses that you’ll use to have a clear vision. With Zenni you can have your choices of glasses and lens without feeling the guilt of spending too much, they have wide selection to choose from. Just see what I’ve got! When he gave me pink roses I felt younger, the time when I'm beginning to see some white hairs on my head! Maybe our age are just adding up but we're still the same people who fell in love couple of years ago. I'm beginning to think that the song 'kahit maputi na ang buhok ko' really happened on some couples, that people can really be so romantic even after many years of marriage. In this time and age of short relationships some couples can still fight for their love to survive and be contented with each other. What's the secret? It's got to be 'putting God in the center of your love and relationship'. Trials and problems are always there to test your love but God will be there also to help you conquer all. 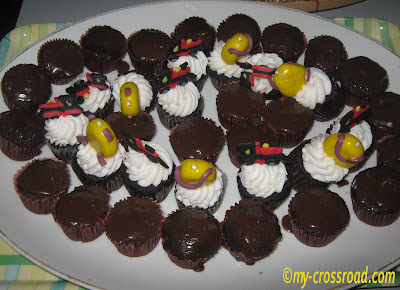 These are choco mini cakes served on one of my officemates' despedida party, no she's not going outside the country she'll just work on another company. We just really love eating and we always find an occasion to justify our cravings lol! See Mom and Josh here! They're so happy and sweet, you can feel how they love each other here! But of course Mom has cared for Josh since he was a baby and now that he's a preschooler now she's his tutor, reason why he's good in school! I have other entry here! Got a call from big brother and he asked me to cook something for his younger daughter Mitch. She’s having a birthday celebration tomorrow Feb. 10. Mitch is his third kid and the youngest girl in the family, the same age as my Gengen. They wanted me to cook macaroons for Mitch’ friends and we decided to use oven toaster instead of my gas range because I’m going to cook in their house. I have plenty of stock supplies of dessicated coconut and paper cups which my officemate bought for me in a baking supplies store in Blumentritt. It costs me little because I bought my supplies at wholesale costs so I want to use it for my family’s birthdays. They just bought some other ingredients and we started mixing at 9pm. Oh well I’ve mixed a lot that’s good for 300 plus goodies so I left them baking the remaining mixture, hope they will take care not to burn it lol! 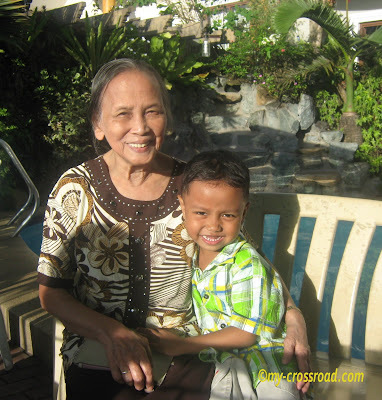 My nieces and nephews really love the food that I always cook especially leche flan and macaroons and I enjoy it! I didn’t know that signs on the building can really help someone in times of trouble. My friend who just recently landed a job on a high-rise building encountered a slight problem on her first week. Being new on the place she didn’t know exactly the way around the building. When the elevator malfunctioned and electricity went off also she didn’t know the way out and because she has no one beside her she figured her way on her own. She was very thankful to find the glow in the dark exit sign on her way out. It helped her find the way through the dark aisle of the place and finally made her graceful exit without looking so ignorant of the building premises. Now she promised herself not be alone in going home to avoid things like these. This is a tag from Gem last December and I've finally found the time to do it, Thanks Gem for this tag I appreciate your thought! Here are some revelations about me lol! C. Cake or pie? I love both but If I'm to choose between them I'll choose pies. D. Day of choice? I love Sundays because that's my day of service with God and we're all together on that day, no work just time for service and for family. E. Essential item? bible, camera, cellphone and computer that's for my soul, my flair/interests, communication and computer which is my means of earning money. G. Gummy bears or worms? gummy bears and worms lol! I. Favorite indulgence? french fries and ice cream, my family love it together! L. Life isn’t complete without? God and my family. It really makes my life complete. M. Marriage date? May 4, 1996. N. Number of magazine subscriptions? none, I search and read them online, it's cheaper you now! I have books also. O. Oranges or apples? I love red delicious apples. P. Phobias? I hate closed areas and working on high buildings! R. Reasons to smile? When I have dayoff from work and I can spend time with my family. S. Season of choice? I enjoy cool sunny season but sometimes I like rainy season as long as it's not stormy and when I'm at home. T. Tag 5 people. Cecile, ChinkyMel, Mira, Lainy and Liza. U. Unknown fact about me? I took up my Computer Engineering course just to have a sure job after graduation and I'm successful on getting my desired jobs but my flair and interest is really on being a Chemist or Writer. Now instead of mixing chemicals I'm mixing food on my cooking hobby and I'm writing and sharing my thoughts through my blogs. V. Vegetable? bitter gourd, I love the taste when it's cooked with fried tofu and egg! W. Worst habit? the only vice I have is drinking coffee, beside that I'm a health conscious human! X. X-ray or ultrasound? Do I have to choose? Ok I prefer ultrasound. I love wearing watches since I was in my fourth grade and father used to give me nice ones because he knows that would make me happy. I’m not so fond of wearing other jewelries because it’s too girly for me. I want to look as simple as possible then because even as a child I’m basically uncomplicated! Watches for me are a human’s best accessory because we all defend on time on majority of our activities. We need to know the time to go to school, to our work and for some to monitor shows on television like the folks who watched telenovelas. When mobile phones became so popular that it’s more a necessity now than luxury I sometimes leave my watch at home because I don’t to carry much when I go to work. I just want to wear my ring and glasses because I ride on a public vehicle and I might bump on bad elements, I’ve already experienced that so to avoid repeat occurrence I only wear essentials. My flair for watches returned now when I saw Ulysse Nardin model watches. I’m browsing some specials there and finally liked one or two of their featured models. Cute and simple! I love the color of woo particularly this sofa, it's actually my brother's sofa. He didnt even know I took a picture of this one lol! If he saw me he'll tease me again like her wife that I'm like a photographer. But I think blogging and photography is a perfect match don't you think? It's easy to write stories when you have pictures to go with it. It's true that a picture paints a thousand words! As always I'm not all wordless! See my entry in Moments of My Life! For more WW entries click here. Watching movies is a nice relaxation to everyone but since born-again Christians don’t watch movie on theaters we just confine ourselves to home video watching. 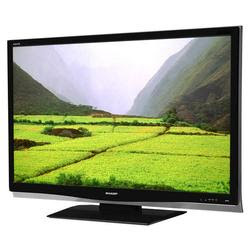 We make sure that our DVDs and TV sets are always in good condition because it’s the only way that we can watch movies. Some of the friends I know invest a lot in having wide screen TVs so they can watch movies as if they’re on the big screen. 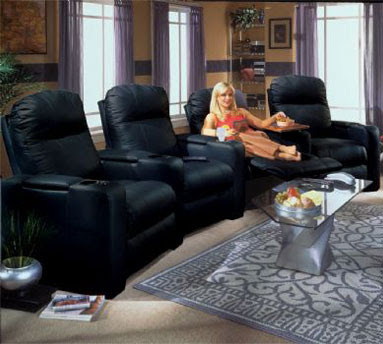 Not only that they also buy some entertainment furniture like home theatre seating that perfectly fits their wide screen television to have a cozy feeling while watching on cinema-like screen. I’ve seen their home video room and it’s really splendid!